The scene remains cordoned off this morning. A GAS LEAK in London’s West End caused the evacuation of 1,450 people from a nearby hotel and nightclub in the early hours of this morning. Fire crews were called to Craven Street in the Strand at about 2am last night. London Fire Brigade have said they they discovered “high levels of natural gas coming off of a ruptured gas main” when they surveyed the area. The area is popular with tourists and Met Police were also called to the scene to help evacuate people from the Amba Hotel and Heaven nightclub. The Charing Cross underground station is closed this morning and the area remains cordoned off. The Strand, a major road running from Trafalgar Square to Waterloo Bridge, was also closed and people were asked to avoid the area. 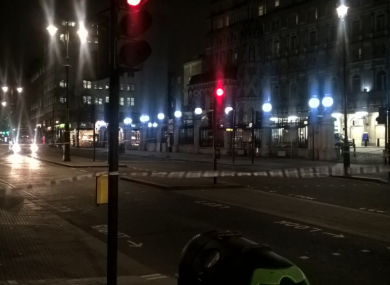 “This is a large gas leak in the street and as appreciation we’ve evacuated people and Charing Cross Station is closed,” said Brett Loft of London Fire Brigade. High levels of natural gas have still been detected in nearby buildings. London Fire Brigade said it did not yet know the cause of the gas leak, but engineers were attending. Email “Gas leak in London's West End causes 2am evacuation from hotel and nightclub”. Feedback on “Gas leak in London's West End causes 2am evacuation from hotel and nightclub”.